Back in December--when I was looking for Christmas stories--I discovered Tomie DePaola's picture books. We started with his Old Befana, loved Little Grunt, and then found The Knight and the Dragon (mentioned in my post about dragon stories). 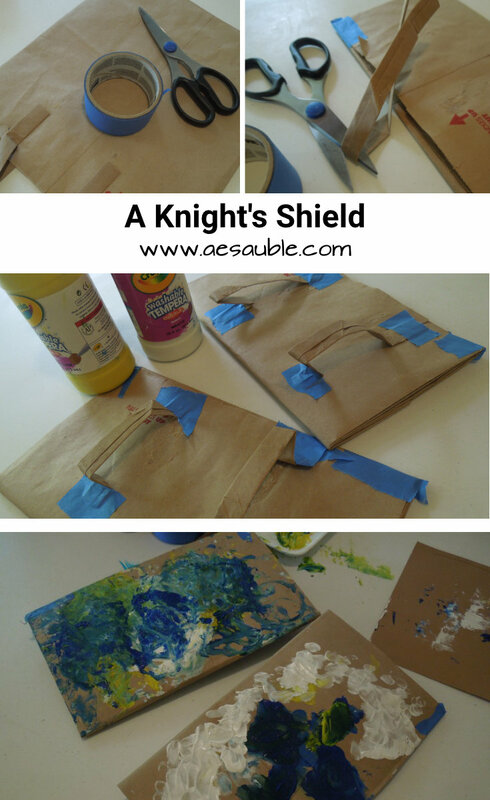 We were reading The Knight and The Dragon while we were doing another finger painting project--the same day, co-incidentally, that I had cut a couple of paper bags up for jackets. * Since the knight in the story had to create his own armor, and since the jackets did look rather like breastplates, I started to wonder whether we could also create shields from the paper bags. We could, and we did. This is, as usual, a fairly simple project. Take a paper-bag. Any grocery store bag with handles will work, though one with less printing works a bit better. Help your kids detach the handles from the top of the bag. Fold the bag down flat and fold the end over, taping or stapling it down to create a small, sturdy rectangle. Then, attach the handles side-by-side to the bag of your rectangle, arm straps. We used tape, but staples or glue might work as well. The handles just need to be secure. Turn the rectangle over and paint the front. If you want, you can help your kids pick an image and draw it onto the bag before painting, or they can improvise as they go. We created an airplane for our design. *The paper-bag jackets idea came from a kid activity at our local nature center.